How many is too many? 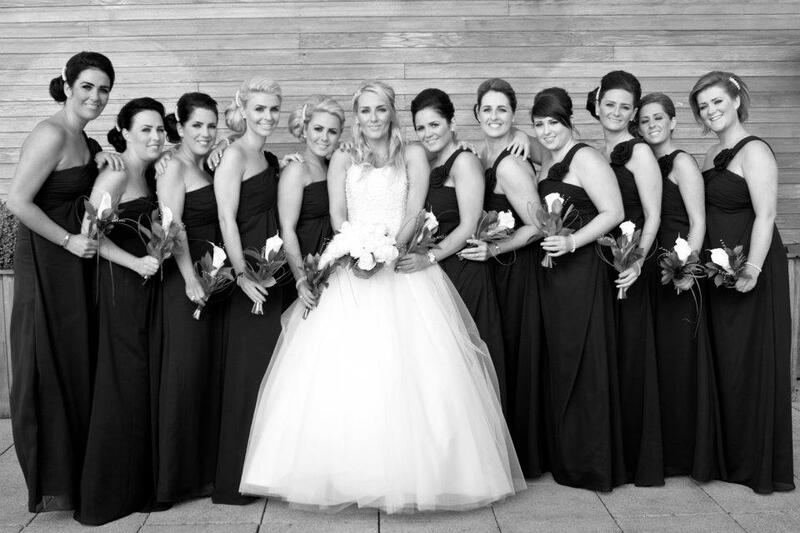 Meet Laura & her 11 Bridesmaids! So how many Bridesmaids is too many? 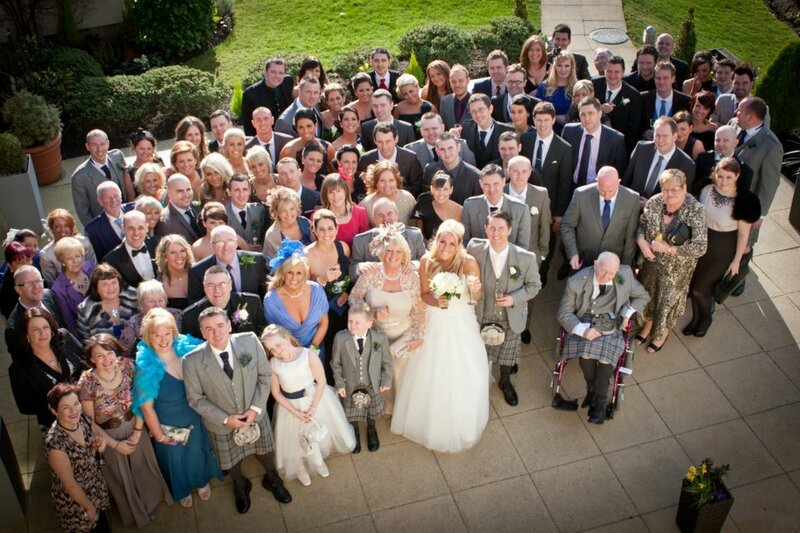 When Laura and Johnny got married, they had 11 Bridesmaids at their Civil Ceremony in Ayrshire! 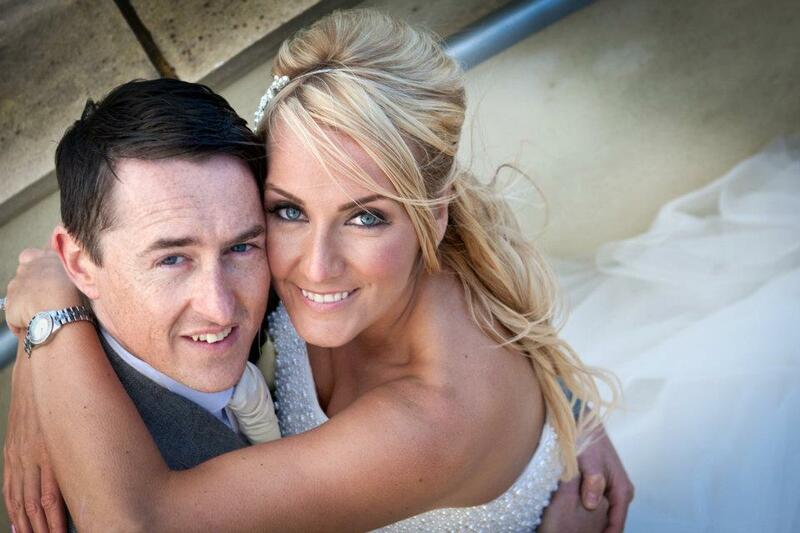 “As soon as we got engaged my fiance was horrified when I told him I needed to have 11 Bridesmaids but I honestly couldn’t choose as it was my two cousins who are like my sisters Charlene & Ashley, Johnny’s sister and niece Diane & Lisa, my longest best friend Chief Bridesmaid Elaine and six of my bestest friends Michelle, Gemma, Jen, Nikki, Caroline and Susan. I had a very clear idea of the style and colour I wanted because there was so many I didn’t want too bold or bright a colour. I went for a dark navy and I knew I wanted a one shoulder grecian style as this style would suit them all. I was very lucky as they all tried on the exact dress I wanted and they all loved it. My Bridesmaids were a fantastic help with the Wedding and were great at organising my two Hen Nights, one here in a function hall they hired for me and also a weekend in Tenerife. “I love my dress so much. Before I went looking I had it in my head I didn’t want a big dress but as soon as I tried my dress on I felt like an absolute Princess and didn’t want to take it off! It was a pearl bodice and a full tulle skirt with a lace up back. I also had full swaroski crystal shoes to go with my Princess dress. I still always look at it. I loved having photographs taken and my Photographer Lauren Stirling was amazing and with being February we were so lucky to have the sun out and a blue sky. What were your thoughts as you walked down the aisle? I walked down the aisle to Kings of Leon, “Use Somebody” by the Vitamin String Quartet. I loved the moment when Johnny turned round to look at me coming down the aisle. I got very emotional when I saw Johnny and couldn’t wait to walk back down the aisle as his wife! We had 90 guests all day and we had another 90 at the evening so 180 in total at the evening. 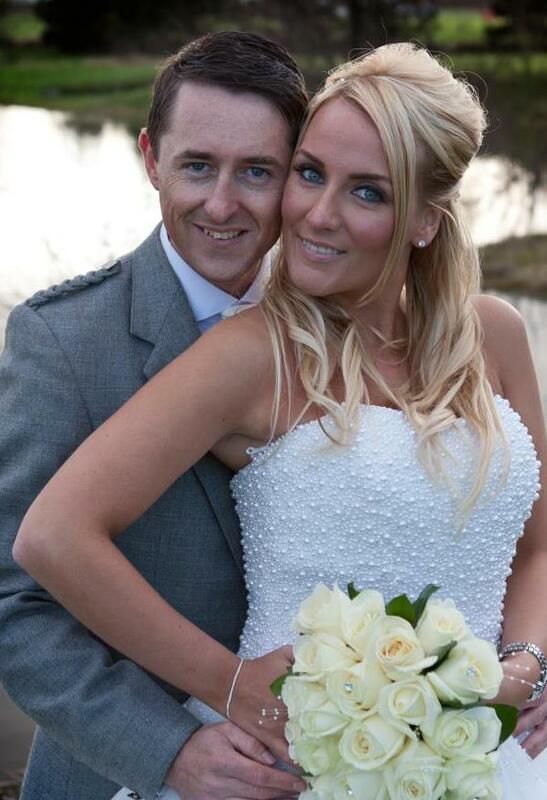 The reason I choose the Gailes, Irvine was down to its modern and friendly atmosphere. The Bridal Penthouse suit at the Gailes is out of this world, it was absolutely amazing and the perfect place to be with eleven Bridesmaids the night before and then the first night with my new husband. The Bridal Suite has a large living room, kitchen, 3 large bedrooms and a spa room with a sauna, steam room and jacuzzi bath. The venue also has a beautiful rooftop conservatory where Johnny and I got married. James Morrison “You Make It Real To Me”, then to get the evening started we had Chris Brown “Yea Yea Yea” as our second song and two confetti cannons went off! How involved was your Groom in the planning? Very involved! He came to a few Wedding Shows and he loves music so he prepared the full Wedding dinner playlist and a playlist for the D.J. As we had got engaged in Mexico, the tablenames were Mexican themed. Johnny and I wanted to make the dinner fun so every table had a Laura and Johnny quiz and the winning table won a bottle of champagne. We also played the After Eight Game where someone from each table had to come up to the top table and try and wiggle an after eight down to their mouth from their forehead without using their hands, this was really funny and again the winner won a bottle of champagne for their table. We had props and celebrity masks on all of the tables at night including Posh and Becks, Keith Lemon, Lady Gaga, Gary Barlow and many more. We also had blow up guitars and saxaphones on the tables at night – all the guests loved it! Which parts of the Day were the most emotional? The Ceremony was the most emotional and when the lights came on at the end at the end of the night and people were starting to get on the bus, as that was it over so that was emotional too. Johnny’s mum sadly died of cancer 4 years ago so we had £1 cancer research donation badges as favours. What advice would you give Bride to Bride? Go to as many Wedding Shows as you can, they are fantastic for ideas to book things that you might not have thought of and it also gets you very excited! Don’t stress with planning, everything fits into place on the day, it’s advice I was given! What do you remember most about the day? Everything I really had such a great day and if I was to do it all again wouldn’t change a thing! It was the best day of my life! I know everyone says this but it’s because its true and you feel the happiest & luckiest girl in the world! We were delighted to feature Laura & Johnny’s Wedding, what an inspiration she is to other Brides considering having lots of Bridesmaids and we are so glad that she chose to share her story and photographs with us! We wish Laura and Johnny all the love, luck and happiness in the world! All copyright for Photography is to Lauren Stirling Photography. If you would love us to feature your Wedding Day, then do drop us an email to mail@theglasgowgirlsweddingguide.com!